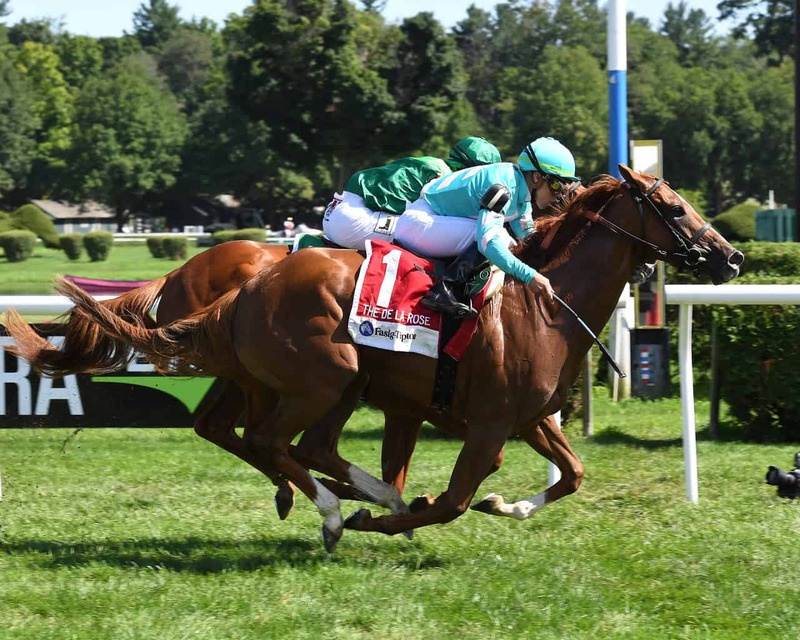 SARATOGA SPRINGS, NY – Trainer Chad Brown had to be thrilled with his pair of runners in Saturday’s $100,000 Fasig-Tipton De La Rose Stakes at Saratoga after Uni launched a strong rally in the stretch and was able to get up just in time to nip her stablemate Precieuse at the wire for her second straight stakes score in 2018. Hitting the gate as she broke from the rail under Irad Ortiz, Jr., Uni sat at the rear of the field while Pas de Soucis set tepid early splits of :25.50, :50.83, and 1:16.07. Still trailing as the field made its way through the far turn, Uni tipped out nearing the exit and hit the top of the stretch running six-wide. Precieuse was the first to tackle the initial leader, doing so with 1/16 of a mile remaining, but Uni was hot on her heels. The two fought gallantly, but a slight misstep near the wire cost Precieuse just enough momentum and gave Uni the opportunity that she needed to gain the advantage and crossed in front by a head in a final time of 1:40.09 for the mile-long event over the soft outer turf course. Pas de Soucis was no match for the top pair but still ran well enough to take third over On Leave. It was a gap of over 3 lengths back to Lido in fifth, with Bletchley less than a length behind her. Thundering Sky gave way after chasing the early pace and completed the order of finish. Care Lady and Well Acquainted were scratched. Uni’s win was her second in as many starts this year, following the $100,000 Plenty of Grace Stakes, and improved her overall record to 12-5-3-2. The British-born 4-year-old daughter of More Than Ready increased her lifetime bankroll to $602,880 for owners Michael Dubb, Head of Plains Partners, Robert V. LaPenta, and Bethlehem Stables. The start was her first since returning from California, where she had shipped in order to run in the Grade 1 Gamely Stakes, but she spiked a fever during travel and was given time off to recover. Uni returned $7.20 to win, $3.50 to place, and $2.90 to show. Precieuse brought back $3.20 to place and $2.90 to show, while Pas de Soucis paid $4.10 to show.